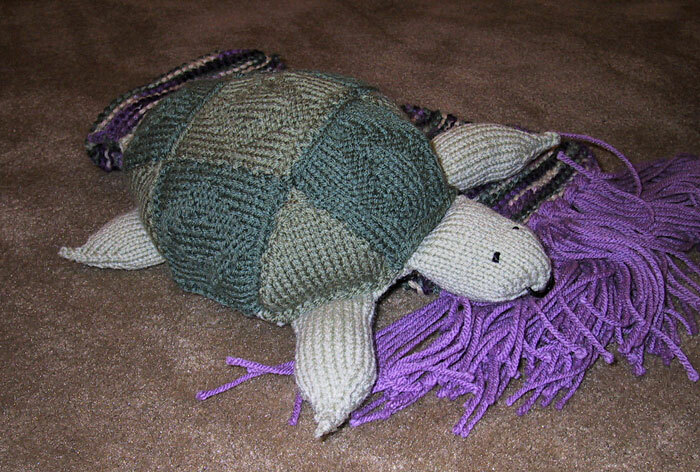 Nothing says “I love you” like a stuffed turtle you knit yourself, right? ‘Cause that’s what my husband got for Valentine’s Day. It wasn’t my idea. He asked for it, so I made it for him. Well, guess what? I’m still not biting. He bought me diamond earrings, so I’m not going to nit-pick about his sexual orientation. No need to rock the boat. Don’t ask. Don’t tell. 1. He bought tickets to “Lord of the Dance”. It was his idea and he went of his own accord. 2. He took his mother to see it with him. 3. He liked it so well, he bought the video. 4. No, really! He bought the video. 6. He listens to Abba. He also likes Erasure. So, anyway, he took his turtle to work with him yesterday. Nobody beat him up. Still can’t figure that one out. hee hee. that is too cute. but seriously, i would say your husband is deranged, not gay. who on earth goes to see michael flatley willingly? The turtle is very cute. And, you know..turtles as not as gay-ish as….well, as Tinkerbell would have been, for instance. Turtles still give off an semi-air of masculinity. You know, they bite and they can be mean suckers. Now, if he had wanted a knitted Tinkerbell to take to work with him, then I’d be worried. look at it this way: you’re not losing a husband, you’re gaining a shopping partner. or something like that, except funnier. you knitted a turtle? wow. i’m terribly impressed. i’m flirting with the idea of learning to knit. okay, i’ve been flirting with it for about five years now. any day i think i may get the nerve to make the first move. AWW! I want one too! Listen to this one – my husband DID confess to me that he was sleeping with men for the first ten years of our marriage. I am trying not to kill myself now. I guess his giant Beanie Baby collection should have been my first clue. I am dead serious…. I think I love your gay husband. The turtle, I’m not so sure about. Wait, maybe that’s the other way around. I totally believed you, but not because of the video. but because he listenes to Erasure. BTW, Sean? With the beard AND wearing a scarf? Scary Gay. 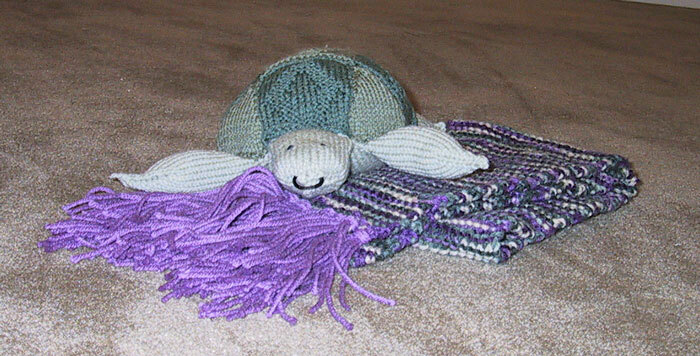 Hey… I just happened to enter your site… And I gotta tell you, I love your husband 🙂 The turtle is so cute… I wish my bi hubby knew how to knit! I am soo jealous. As I sit here with my two loud kids all I can say is :I wish my husband was gay!